Want to play a slot game that has an overall payback of 96.9%? That is just what you get when you play the 5 reel, 15 pay-line slot Cleopatra's Coins. With payline wagers ranging from 1¢ to 50¢ both the nickel slot lover and high roller will enjoy this game. Top prize is a whopping $50,000 while players can win $1250 just playing 5 nickels per pay-line. 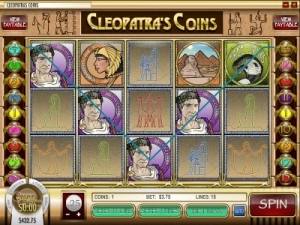 A variety of Ancient Egyptian symbols make up the reels and for most wins 3 or more are required for a hit. The wild symbol is the scared Scarab and substitutes for all Ancient Egyptian symbols except scatters to complete pay-line combinations. Five Scarab symbols award the top prize of 5000 coins but pays 10 coins for just 2. There are two different scatter symbols that award bonus rounds when 3 or more matching symbols stop anywhere on the game reels. The Poisonous Asp symbol triggers a free spin bonus round where players are awarded 10, 20 or 100 free spin at 3 times their wager. Get 3 or more Poisonous Asps during the free spin bonus round and you're awarded additional free spins. Another scatter symbol, Cleopatra's Coins, triggers the Cleopatra's secret chamber ancient urn bonus round. Cleopatra grants you permission to smash 3, 4, or 5 of the ancient urns from a set of 12 to reveal your treasure. The ancient urn bonus round can be triggered during the free spin bonus round. Cleopatra's Coins, with it's smooth running graphics and incredible sound effects will provide any slot enthusiast endless hours of exciting slot entertainment. Neither casino accepts Canadian players.